A visit to St. Peter's can be an overwhelming experience. There is so much great art and architecture here that it is difficult to take it all in. On top of that, there are centuries of history in its dramatic story. Furthermore, it is still one of the world's great places of worship and spirituality. 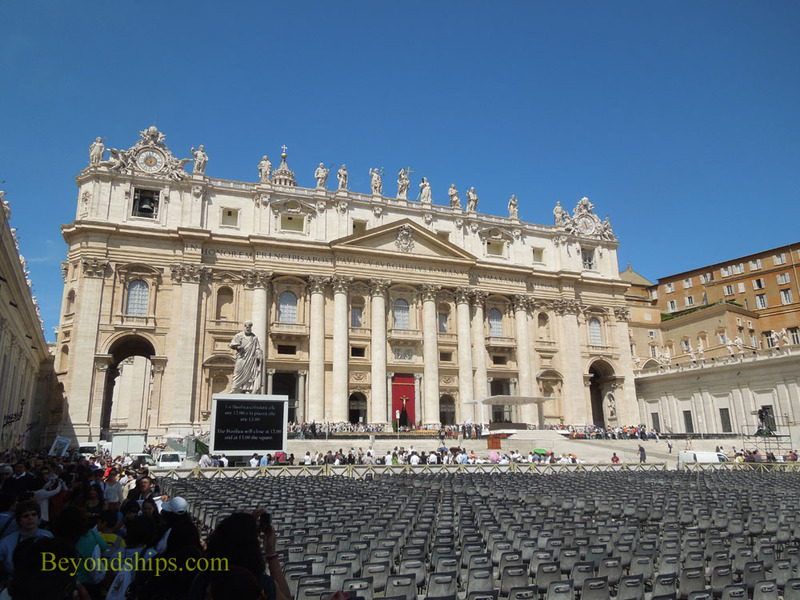 St. Peter's is built on the site where the apostle St. Peter was martyred and buried. In those days, it was the site of an arena known as the Circus of Nero, where many early Christens were killed for their beliefs. After the Emperor Constantine turned to Christianity, he built a large church here, now often referred to as Old St. Peter's Basilica. 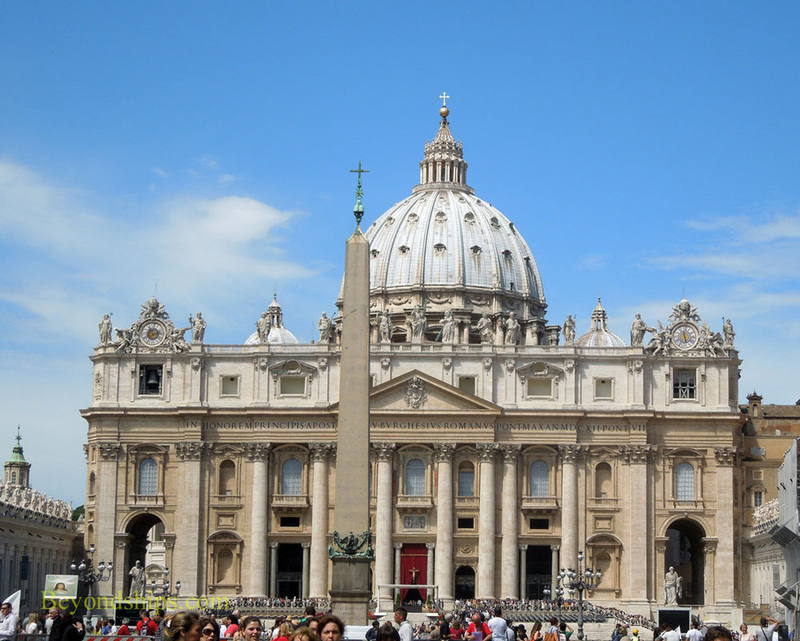 In 1505, Pope Julius II decided to tear down the existing church and build one far grander. For this project, he chose Donato Bramante as his architect. However, over the 120 years that it took to complete this project, there were many architects. However, much of the design we see today is attributed to Michelangelo. St. Peter's Basilica is open daily, April through September from 7:00 a.m. to 7:00 p.m. and October through March 7:00 a.m. to 6:00 p.m. It does close, however, for certain religious events. 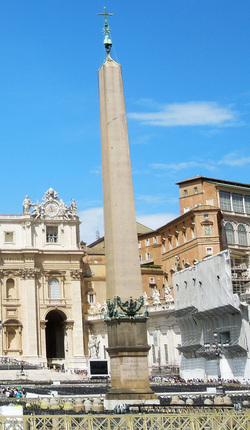 Visitors often approach St. Peter's Square from the Via della Conciliazione. 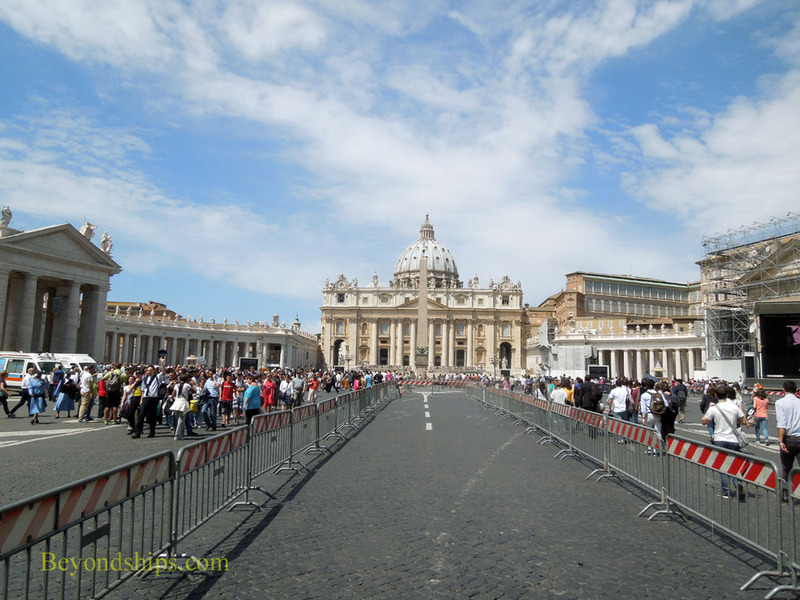 Ahead, they see not only the square but also the dramatic shape of St. Peter's Basilica (above). Today's square is the work of the sculptor Gian Lorenzo Bernini. He designed this massive space in an elliptical shape that measure some 240 meters across. 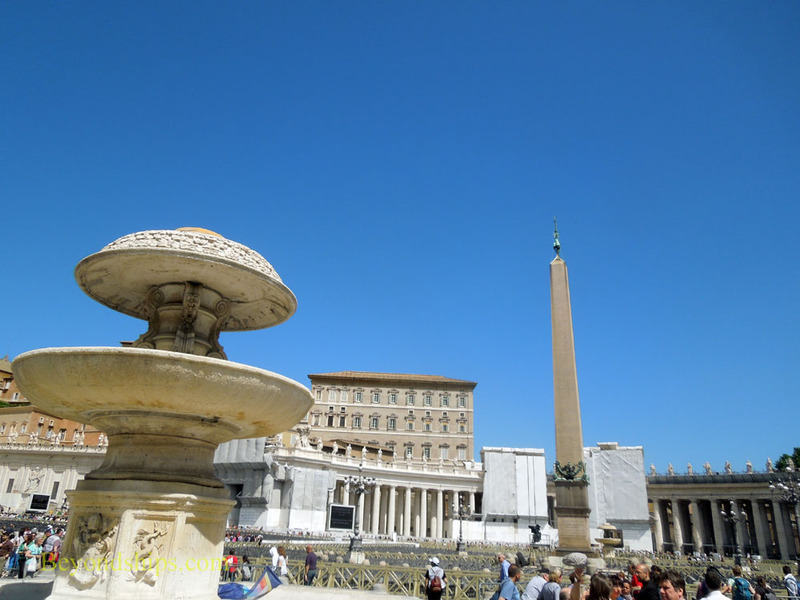 Around the square are a number of places of interest to visitors including: the Vatican Bookstore, restrooms, and a place to check bags free of charge. 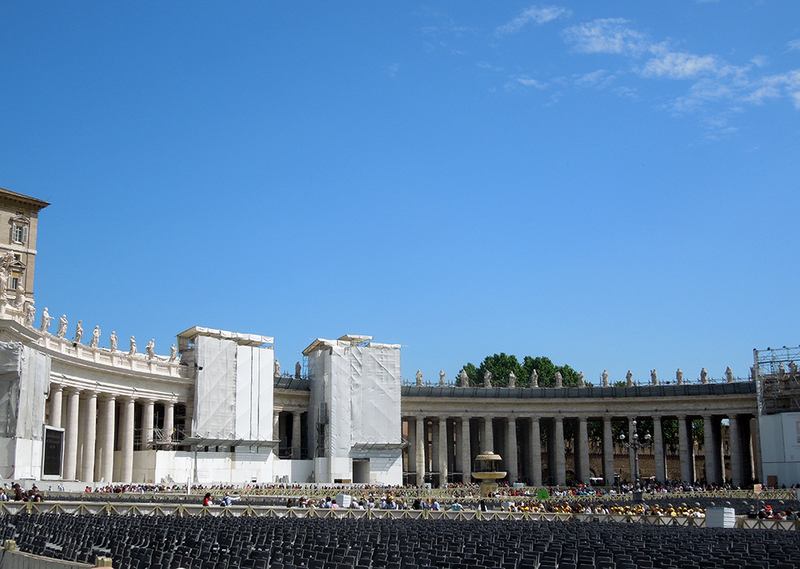 Alexander VII had Bernini create this large square so that a great number of people could receive the Pope's blessing at one time. It still performs this function. 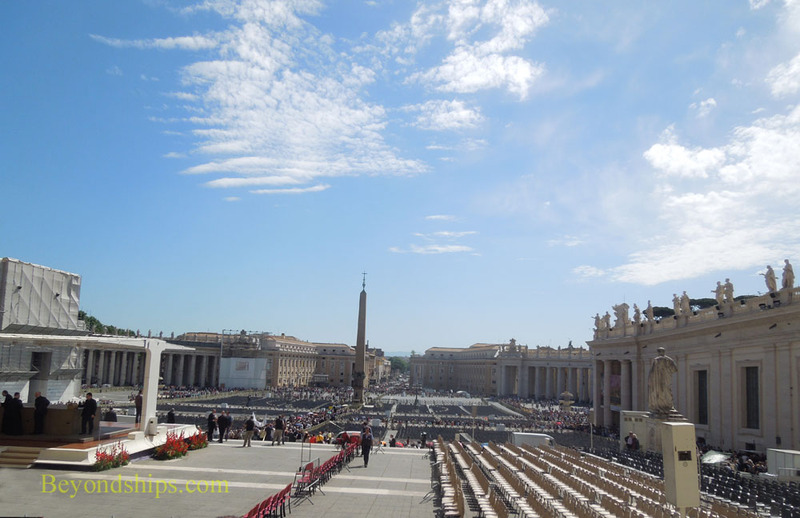 The tall building on the right hand side of the square is the Apostolic Palace (left). 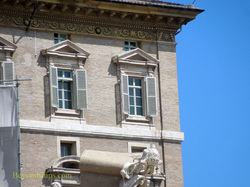 The top two floors are the Pope's apartment. On Sundays, he usually appears at the window second from right to bless the crowd in the square (above). In the middle of the square is an Egyptian obelisk, dating from around 1835 B.C. (left). It was brought to Rome by the Emperor Caligula and stood in the center the Circus of Nero. Therefore, it is said to have witnessed the martyrdom of St. Peter and of many other early Christians. It was moved to its current location by Pope Sixtus V in 1586. Enclosing the square on either side are curving colonnades. These were designed by Bernini and built between 1656 and 1667. The statues on top of the colonnades represent saints and martyrs. 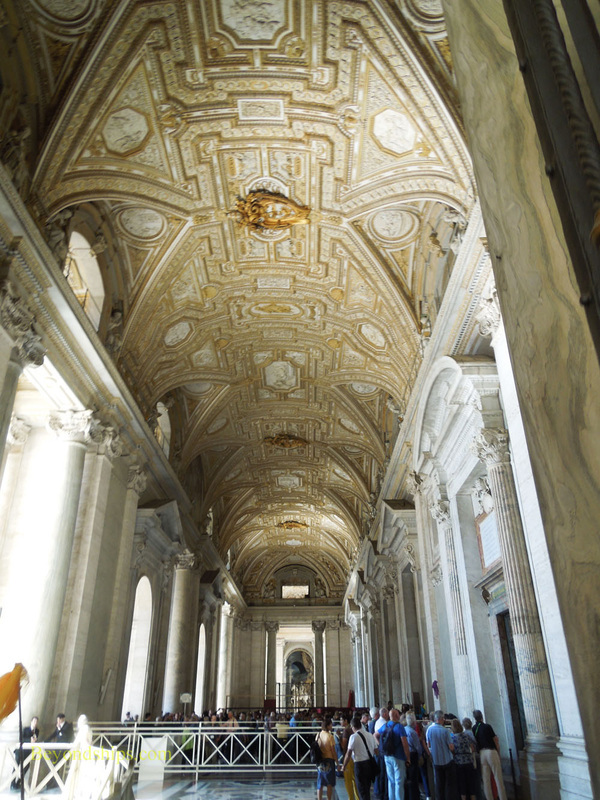 Together, the colonnades give unity to the square and are said to symbolize the loving embrace of the Mother Church. Turning to the Basilica, the facade was designed by Carlo Maderno and was completed in 1614 (left). 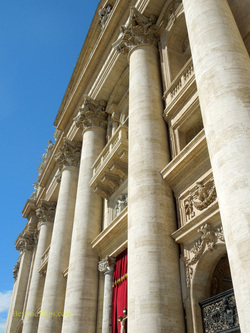 The balcony at the center is the Loggia of the Blessings from which new popes are announced (right). The Portico (left) was also designed by Maderno. 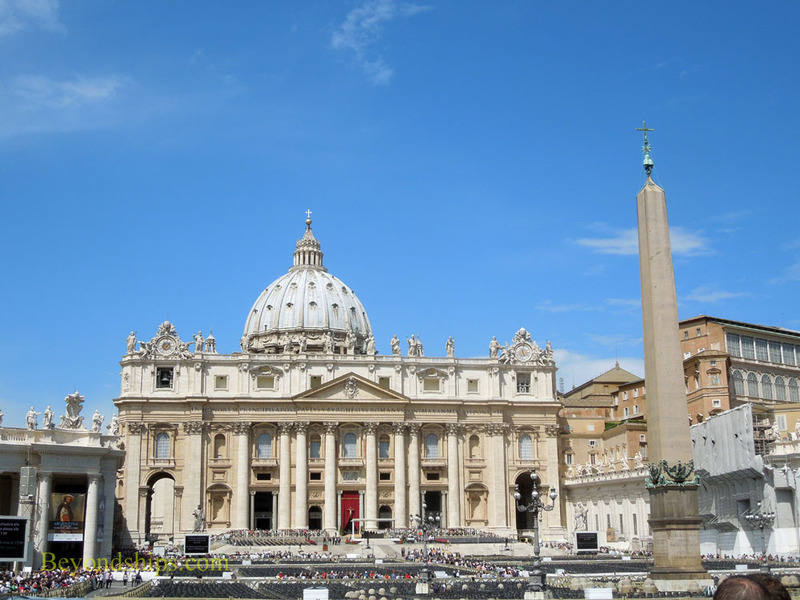 It has extensive decoration including statues of 38 martyred popes. 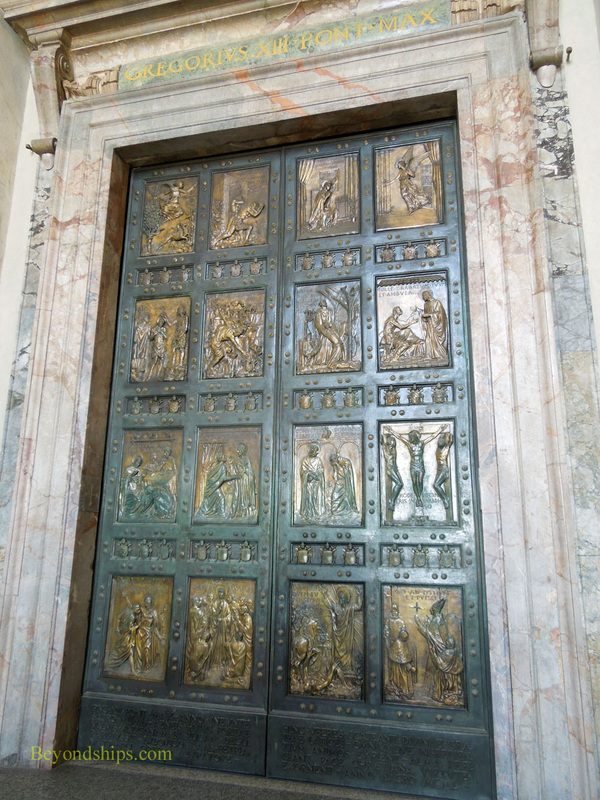 There are five doors leading from the Portico into the interior of the basilica. The last door on the right is the Holy Door (below). It is opened only during Holy Years, which occur every 25 years.